Oleg Kireev, the leader of the project, is one of the most remarkable personalities of the Russian jazz, qualified as a “sax player with a reputation for hard swing and high excitement”. Oleg Kireev’s ethno-jazz project absorbs folklore from all over the world and is bringing us the ancient and everlasting message of eternal harmony. In his „ jazz theatre” the traditional swing, Bashkir guttural singing, African rhythms and French poetry are interlacing. In the world of jazz, open to all influences, it is hard to astonish anyone, but Oleg was the one to realize such a performance, the western press appreciating him as the “Revolutionary Russian musician Oleg Kireev, a surprise hit of the recent Birmingham Jazz Festival. He shows irreproachable professionalism and improvisation technique; he enriches jazz with his personal, emotional and very sincere perception.” (The Evening Mail, UK). Kireev studied piano at the music school and the saxophone at the Arts College. Being by origin a Tatar from Bashkiria and well acquainted with the techniques of guttural singing uzlau, Oleg is masterly combining jazz standards with folklore. He started his career in 1985, in Ufa, by founding the group Orlan, promoting ethno approach to jazz. Bashkir Legends, the first album of the group, recorded by Melodia, brought an instant success to the group, followed by extensive tours in the country and abroad. Oleg continued his career in Poland, playing at international festivals with the stars of world jazz. Bud Shank, the famous American saxophonist, after hearing Oleg’s solo album Romantic (1984), offered him a scholarship in the US, at his Bud Shank School. Soon Oleg became the soloist of All Stars Students band, formed by the best students of Shank’s school. With this group Oleg had some solo concerts in the state of Washington, playing alongside Hal Galper and Steve Ellington. He had extensive tours in England, took part in jazz festivals in London Earling Jazz Festival and in Birmingham; he received the diploma for outstanding performance at the jazz festival in Montreux in 1996, the diploma of Jazz Jamboree festival in Warsaw. In 2000, 70 000 copies of his CD Love Letters have been sold in no time. This album brought him the title of „Russian Kenny G.” The appreciation of “independent experts” was even more enthusiastic: the American portal Jazzreview.com rated his album Song For Sonny with five stars from five. Compositions from this album are included in various collections of jazz music, alongside works of Fausto Papetti and Grover Washington. Beltaine, the quintet of Celtic music, is inspired by the music of Ireland and Bretagne. Their compositions are a combination of traditional melodies with modern trends, of professionalism with the force of youth. For them the traditional Celtic music is the departing point towards a different musical world, sometimes full with jazz harmonies, sometimes with blues improvisations, and sometimes even with punk expression. The band quickly gained the hearts of the audiences all over the country: in less than two years Beltaine gave almost 200 concerts and took part at the festivals in Katowice, Gdynia, Wroclaw, Przemysl, Lodz. The group also performed at festivals like Nowa Tradycja in Warsaw, Magiczne Wyspy Zielone in Krakow, Folkovy Kvitek in Praga, Beltaine in Slovakia, Shants Festival and Zeza in Hungary, at the festival of Celtic music Zamek 2004 in Bedzin. The group is the organizer of two festivals - the festival of Celtic music Irlandzka Majowka in Katowice and the festival Zamek in Bedzin. Their music does not leave one indifferent, the musicians succeeding to create an atmosphere of mystery, sinking the audience in dreams and charming it with an original interpretation of old folk melodies. Their own compositions, inspired by traditional Irish melodies, impress by a modern sound and an original arrangement. Soloist, composer, arranger and jazz-eccentric Anjei Kovalev made his studies at the music college S. Balakirev in Nijnii-Novgorod and at the University of Culture and Arts in Petersburg. He worked at the Jazz Orchestra of Estonia (Tallinn), at the Narva Dixieland, at the Lenconcert, and sung in the legendary group Jazz-comfort in Petersburg. He performed at international jazz festivals, sung in music clubs in Germany, France, Estonia, and Russia, and had work contracts with the German company Hapag Lloiyd and the Swiss company International cruise management. Presently he is soloist at the orchestra of composer Vladimir Poliakov, councilor of the Administration of the President of Russia. In his solo program Anjei creates musical compositions, imitating with his voice various musical instruments. Anjei uses the vargan, the Indian flute and the methods of skat singing, performing concomitantly multiple musical partitions – of solo and accompanying instruments. A man-orchestra and musical “provocateur”, Anjei is able to create a fairy atmosphere, full of surprises. Studies in classical jazz and the classic format of the group clearly influenced the repertoire of the trio. In compositions signed by Vit Svec and Matej Benko one can easily sense the influence of classical music, as well as Czech and Latin folk motives. The trio has been created in 2000 and its first album Trio 02 released by the ARTA publishing house, was appreciated by Harmonie magazine as „The best Czech jazz CD of the year 2002”. The next album Keporkak was released in 2004. The trio performs regularly in Prague’s jazz clubs, as well as throughout the Czech Republic (Karlovy Vary, Liberec, Pisek, Jesenik, Brno) and at jazz festivals abroad (Poland, Germany, Hungary, Slovakia). Vit Svec, graduate of the State Conservatory in Prague, after graduation participated at the jazz workshop in Hungary (under Aladar Pege and Balazs Berkes). He was the founder member of jazz orchestra Transjazz (CD Jazzmagma) and Jazz Unity (CD Soul Eyes and My Foolish Heart). He was a member of the National Theatre Big Band and for many years has worked with trumpeter Michal Gera (CD Fata Morgana and Magomania), also with vibes player Radek Krampl in Vibe Fantasy and with singer Jana Koubkova. Vit is also active in the sphere of classical music, performing with the Orchestra of the National Theatre and with the Film Symphony Orchestra. Matej Benko, graduate of the Prague Conservatory (composition), has been involved in many other jazz projects. As member of Slovakian Quartet, he has taken part in many national and international festivals (Bratislava, Belfort, Innsbruck, Paris). 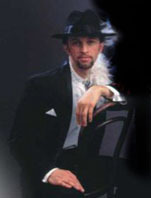 Jan Linhart graduated the Prague Conservatory – drums and piano. From 2000 he is teaching on this conservatory. He has worked with The Swings (CD Java Jive) and Petr Korinek Jazz Orchestra (CD Prague Jazz Sextet - Cronica Domus Saransis). It is difficult to imagine any other musician who would be able to master free improvisation with such a sense of humour, audaciousness and great virtuosity as Gunter Sommer. He was born in Dresden, studied the piano, percussions and drums and started his career in 1970, becoming an essential actor of the European improvised music in the former East Germany. International Jazz Forum and DownBeat Magazine are depicting him unanimously as “an artist who imposed himself in improvised music and created his own style in the European jazz”. Partner or leader of projects or albums recorded with Louis Sclavis, Sylvain Kassap, Franсois Mechali, Cecil Taylor, Didier Levallet, Crams Percussion Staff and Zentralquartett, with Leo Smith and Peter Kowald, Sommer had extensive tours throughout Europe and Japan. Surrounded by the most surprising percussion accessories and by the most accomplished musicians, Gunter Sommer is always full of invention, adding humour and fantasies to his compositions, transforming every concert in a show. Composer, arranger and musicologist, Sylvain Kassap is one of the most important saxophonists-clarinetists of the French jazz, alongside Michel Portal and Louis Sclavis. But, unlike the latter two, Sylvain Kassap moved on to explore untrodden territories of modern music, in search of very demanding creative solutions. In our dynamic century the musician is, at the same time, a brilliant researcher and a lyrical artist, combining emotional sensuality and rich imagination, highest professionalism and a volcanic temperament. His personal universe is a treasury, the wealth of which Kassap himself perhaps hardly suspects, caught in the exploration of the infinite range of nuances offered by the clarinet. „The beauty of the sound and the elasticity of phrasing that is the instrument's hallmark, his talent and professionalism, his temperament, spirit of adventure, audacity and artistic independence made Sylvain Kassap a new reference point in music today.» Michel Contat – Telerame. He becomes professional musician in 1976 and works with Michel Portal (Atelier de creation radiophonique de France Musique, Nuit du Jazz de Ris Orangis). Initiator of a big number of projects, around 10 years ago he was founding the Collectif ZHIVARO , a sort of French All-Stars, getting together with a number of other "friends in jazz" — not least, recognised leaders such as Henri Texier and Claude Barthelemy. He might have become something of an institution in the microcosm of French jazz, one of those musicians that always seem to be at the centre of things. Instead of striking a pose for eternity, Kassap has tacked off to chart his own course, spreading out into myriad directions, taking him further and further away from the stereotyped image. Animated by an unquenchable spirit of freedom, he explores music that is rich in colour and finesse, from free improvisation to contemporary, taking in ethnic influences and composition, constantly fuelling passionate feeling, composing music for his orchestras of most unthinkable formats (clarinets, trumpet, bass, drums). This is his universe the MUSIC modern, eternal, paradoxical and unpredictable, recognising no style and having no goal but one – self-expression pushed to the limits of emotion and sincerity. All his compositions, full of a great sense of drama, narrate, roar out and murmur stories of love and death. Didier Levallet is one of the most important musicians in French jazz, starting his career in 1969. An experienced and refined virtuoso, he knows how to transform his acoustic bass in a soloist instrument, using its whole sonority. In his compositions, Levallet is weaving an exquisite lace of endless configurations, combining dramatic accents with delicate sensuality, creating conflicts or harmonious accords. Every musical moment of his compositions is taking both musicians and audience farther and higher in a free fly. Levallet plays in Trio Levallet-Marais-Pifarely, Didier Levallet Tentet, Didier Levallet Quintet, Trio Beckett-Levallet-Marsh, Duo Gerard Marais-Didier Levallet, Dominique Pifarely Trio; with Didier Lockwood in a number of projects; with Swing Strings System and with a number of most inventive improvisers of the French jazz. In the quartet repertoire, including Tevet Sela’s compositions, elements of African and Middle Eastern music are interwoven with soulful jazz-funk. Tevet Sela, composer and saxophonist, one of Israel's most prominent musicians, started studying the classical piano and the saxophone at the age of 7. When he was 12 he began playing jazz and when 16 he started to compose his own music. Ggraduate of the prestigious Thelma Yelin School of Arts, winner of several scholarships of the American cultural fund, Tevet Sela plays as a soloist or partner in numerous orchestras, appears in TV shows, writes music for films and theatre performances and has toured in France and the Netherlands as a featured soloist. Tevet represented Israel in an international UNICEF benefit concert, broadcasted in 35 countries throughout the world, alongside such international artists as David Bowie, Youssou N'doure, Al Jarreau, Julio Iglesias and more. In the year 2000 Tevet established his own band, touring at international jazz festivals and venues, both in Israel and Europe. Tevet's style of music came from being exposed to the rich blend of cultures found in Israeli society, ranging from Jewish to North African and from Middle Eastern to Western music. Two different worlds inspire Raj Mohan to compose his special music for Vistar quartet: Indian and Arabic music from the East is mixed with the western jazz. Raj Mohan is a Hindustani singer, musician, composer and poet, born in Surinam and living in the Netherlands since 1974. Raj learned the ins and outs of classical Hindustani music (Khayal style) from his guru Ustad Jamaluddin Bhartiya, an adept of the illustrious Pundit Ravi Shankar; he studied classical North Indian vocal styles like Ghazals, Geets and Nazms in which he is performing since 1985; studied different forms of Urdu poetry and Bhajans (devotional songs) or Bollywood songs. Although Raj has been educated in the tradition of classical Indian music, he also likes to experiment with more contemporary genres, such as jazz, Hindi pop, hard rock, Asian underground and New Age. However, in all these experiments his firm roots in Indian music remain clearly discernible. Some of the world renowned artists with whom he performed are the jazz star Denise Jannah, the well-known British Asian Underground group Najma Akhtar and the Dutch heavy metal/punk-rock group Van Katoen. Founder and leader of groups like Raj Mohan, Vistar and Shai’raina, Raj worked as an associate music director in the heart of the Bombay film industry, wrote music for theatre performances, lyrics and poems in Sarnaami/Bhojpuri, Hindi, Sranan tongo and Dutch languages. Raj sings compositions of Rabindranath Tagore in the original Bengali language. Raj also writes lyrics in Sarnaami and sets them to beautiful and original compositions. During 2003-2004, every week one of his poems in the Sarnaami/Bhojpuri language was broadcasted by the Dutch national radio. Non-Indian poetry is translated to and sung by Raj Mohan in Hindi. These songs are all based on poems of great poets like Alexandr Pushkin, Edgar Cairo, Nazim Hikmet, Rutger Kopland. The accomplished musician Suresh Sardjoe takes part in practically all Raj Mohan’ musical projects. Mark Alban Lotz – composer, teacher, music critic and brilliant instrumentalist, playing piccolo, alto flute, bass flute, Indian bamboo flutes, grew up in Thailand, Uganda and Germany. He started playing the flute in Bonn and followed his studies at the Berlin University of Ethnology and Musicology. He studied classical, contemporary music and jazz at the Hilversum Conservatory, at the "Amsterdam School of Arts", in New York and California. His career started in 1984; he is finalist of the 1989 Karlovy Vary Jazz Competition and prize winner of the 1990/1992 Middelsee Jazz Festival Competition. Jazz is the main trend in Mark Lotz creation. After years of experiments he created his own style: African rhythms, dance music, ethno and classic music, everything is reflected in the artist’s compositions, combined with free improvisation. Mark is the leader of Mark Lotz Mainstream Jazz Quartet, Flute Jazz Trio, of Shango's Dance - Cuban Roots, of quintet Lotz Of Music, Soapera - musical theatre, Global Village Orchestra, quartet Three basses and a flute, Afro Lounge – New Yoruba Beat, of the MWWm (Mark's Weird World Music) orchestra. He is also playing with Seafood group, with the big-band Zuiderzee Orchestra, in the ensemble of Cuban music Estrella’s Guajira, in Shai'raina, Beat Sharks, Page One (jazzy dance act) and Vistar. He is critic for the magazine 'Muziek en Onderwijs', since 1984 he is teaching flute, improvisation and theory, jazz and jazz history at the Academy of Music Alphen a/d Rijn, at Academy of Music Amstelveen and the Culturele Circel Amstelveen foundation. Composed music for string quartets, for piano trio and big-bands, for films and theatre performances. The German musician Meinrad Kneer is playing with classical orchestras, practices improvised jazz with Albert van Veenendaal, Ann la Berge, Felicity Provan, Maartje ten Hoorn, Augusto Forti si Fred Frith, performing at various international jazz festivals. He takes part in experimental theatrical projects with Jack Gallagher, Suzan Tunca and Reinier Schimmel in Amsterdam. Composer and leader of Dalgoo quartet, he toured Europe and Russia with the author program New Anatomy, in which poems, prose and diaries by the absurdist author Daniil Harms, in the musical form imagined by Meinard, took the shape of a musical epic performance – a protest against arbitrary violence. This performance is a mix of free improvisation, Harms’ black humor, his vision of the absurd of everyday life and of the unpredictable destiny, of voice, music, English, Dutch, German and Russian languages. This musical performance tells us about the charm and talent of the Russian avant-gardism, about the tragic destiny of Daniil Harms, destroyed by the Stalinist terror. The group was formed in April, 2004. The jazz musicians Dorel Burlacu and Alexandru Murzac decided to compose and to play their own music ndd invited the drummer Igor Carpenco to join them. The result was an interesting modern music with elements of jazz, funk, avant-garde and ethno music. 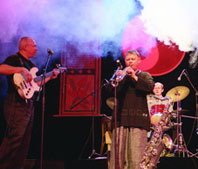 The successful debut of group took place at the Ethno-jazz festival 2004. Their debut album will be released in 2005. The leader of the group, Alexander Zavalii, teacher at the Academy of Arts, founded the group in 2004, gathering together musicians with different professional experience (students and teachers of the Academy). LIFE MODEL is currently playing only its own music. Their style can be defined as modern jazz with electronic synthesized sound and drum grooves. The music of the group is also strongly influenced by the interest of Alexandr Zavalii for ethno music from Western Africa and the Orient and the interest of the group for world music. Emotional and expressive compositions of the group are proof of musicians’ professionalism and serious attitude towards music. Compositions excel by variety – they are sometimes exciting and full of vigorous Caribbean rhythms, sometimes you find yourself in the arid deserts of the Orient, or, trying to break the limits of composition, the group charm the audience with a piece of music of unusual measure – 7/4, or impress you by a lyrical and expressive ballad. In 2005 the group intends to release its first album – Dream Makers. Compositions from this album are included in the program of the festival. Laureate of the contest DODJ 2004 (Donetsk), UniVox jazz vocal group has been created in 1999 by a group of students and teachers of the „Gavriil Muzicescu” Conservatory. The repertoire of the group includes compositions of most various styles and genres, performed a cappella. But the preferred style of UniVox group is the jazz. Alongside well-known compositions of jazz mainstream, the group is performing music of Moldovan composers – Igor Iachimciuc, Marian Starcea, Dmitri Belinschi. These compositions in the interpretation of young singers is the most attractive part of their programs at the national and international festivals: Martisor, Jazz in week-end and Etno-jazz festivals in Chisinau, Intact festival in Cluj-Napoca, Romania, FIMU in Belfort, France, New Impro Music Festival in Regensburg, Germany. The vocalists of the group took part in the workshops of such jazz celebrities as Anca Pargel, Mihail Alperin, Ivan Paduard.